The 14th day of Awakening - otherwise known to most of Neopia as "Valentine's Day." The lines to the Chocolate Factory are long, new friendships are blooming, and your pets might just have hearts in their eyes. But the best part of Valentine's Day for everyone involved are the pink, heart-themed customizations that start showing up. Every theme from pink and flowery to hearts and clouds, this is the season to really get your "lurv" on with customizing. And I'm here to help with a few suggestions. Please note that this article includes both NC and NP options to appeal to every Neopet and their human, and values may have changed from the time I wrote this article. What's the next best thing to sending a fun Valentine Neogreeting to your closest Neofriend? Dressing up your pet to look the part! This fun but simple background was released in the NC Mall in January 2012 through the Drifting Hearts Valentine Mystery Capsule. This background is perfect for the holiday as it puts your pet, regardless of species, right in the middle of a Valentine's Day Card; glitter, hearts and all. Ah... a beautiful shower of light hearts that are full of love. If a full-on heart background is too much for you, this shower is another option. It will give your pet just the right amount of "lurv," putting them right in the midst of a subtle shower of hearts. Best of all, theses colors don't necessarily scream "Valentine's Day," so your pet can be surrounded by a shower of hearts all year long! Especially good for that pet that complains about all of the pink this time of year. Who says Valentines Day has to be full of pink hearts? This is an alternative for your grey Neopet who has probably... ahem... been moping around about Valentine's Day since the end of the Advent Calendar. This monotone shower can be used all year round, but it's especially good this time of year. This wouldn't be a good Valentines wearable guide without an anti-Valentines option for you. This wearable's description states that "Valentines Day makes you see everything in a new light." This will be especially true for your pet who will be placed behind a subtle window, decorated with hearts and velvet curtains. This goes into the "subtle" department because you can match it with the most heart-full Valentines Day background of your choice, or the dreariest. The options are limitless. Best of all, thanks to Dyeworks, this comes in multiple colors if you're not a big fan of the traditional pink/purple theme that shows up this time of year. Maybe you have most of your customization for Valentine's Day prepared and ready to go, but you're still waiting on that one last finishing touch. With the Vision of Hearts item, your pet will literally have hearts in their eyes -- and what better way to celebrate Valentines Day than with that final heart effect? This item was released in 2013 during the Sealed with a Gift event but don't worry, there's still time to trade for it on the NC Mall board! I know you saw this one coming as soon as you read "Valentine's Day," but this wouldn't be a true customizing guide without this background. It costs 80,000 Neopoints and puts your pet right in the center of a pink, heart, cloudy dream. Everything that the 14th Day of Awakening is made of. The colors in this background are perfect for Valentine's Day and it will suit any pet, even if you have to bribe them with a bag of Chocolate Neodrops to wear it. This wearable doesn't follow the traditional pink/red color scheme we always see around Valentine's Day, but it does feature an eye-catching set of bushes that have been trimmed into hearts for the season. At only 6,000 Neopoints, this is a perfect foreground to top off your seasonal customization. Best of all, it's a great way to transition from "Valentine's Day" to "Spring" with green bushes topped off with pink flowers. 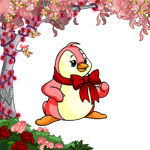 Not only will your pet be prepared for Valentnine's Day, but your Neopet can celebrate the special holiday all spring long! Maybe this isn't the obvious choice for Valentine's Day, but isn't this holiday all about spending time with your family and friends? That's exactly what this little wearable will do! This adorable purple Moehog will give your pet a tight hug and nothing will make your Neofriends say "aww" any faster. Even if your pet isn't the biggest fan of Valentine's Day, a hug from this Moehog will get even the greyest Neopet into the spirit. Now that you're ready to dress up for Valentine's Day in style, make sure you finish celebrating the holiday by sending a Valentine's Neogreeting to one of your Neofriends! It's like April Fools Day, but in February instead.